Mega Fortune, a Net Entertainment (NetEnt) progressive online video slot based on the luxury theme, comes with free spins and progressive jackpots. The top fixed jackpot is worth 10,000 coins. Mega Fortune can be played for fun or real money. To play the slot for real money, players need to first place a bet. To do this, they must activate as few or as many of the slot’s 25 paylines. Players can bet up to 4 coins per active payline and choose from coin values that range from $0.01 to $0.50. The bet range for this slot is, therefore, $0.01 to $50.00, which makes it one of the most affordable slots in the NetEnt portfolio. Players can also customize their gaming experience as they wish. They can turn the sound effects and background music on or off, view their gaming history, and change the quality of the graphics. They can use the Autoplay feature to spin the reels automatically and the Skill Stop feature to stop the reels in mid-spin to grab a winning combination. NetEnt’s Mega Fortune is based on a theme all slots players love—luxury. The slot’s graphics, audio effects, imagery, and animations can make players feel as if they are on the lap of luxury. The reels feature symbols of limousines, diamond watches, brandy and cigars, and money. There are a few high-value card symbols too set in gold and silver rings. Mega Fortune, therefore, is all about riches and getting rich quick. Mega Fortune has not one, but three progressive jackpots—Mega Progressive Jackpot, Major Progressive Jackpot, and Rapid Progressive Jackpot. Players need to bet maximum in order to win the Mega Progressive Jackpot. To win one of these jackpots, players need to spin a combination of Mega Fortune Wheel symbols and activate the Mega Fortune Bonus Game. The Yacht symbol serves as the wild in case of Mega Fortune slot. This symbol can substitute for all other symbols across the reels except the Mega Fortune Wheel symbol and the scatter symbol. Players can use the wild symbol to create winning combinations and win extra payouts. Mega Fortune has two scatter symbols—the Champagne symbol and the Mega Fortune Wheel. The Champagne symbols pay irrespective of their location on the reels. If players land two, three, four, or five Champagne symbols anywhere on the reels, they will win payouts of x2, x3, x10, and x100 their bet amounts, respectively. 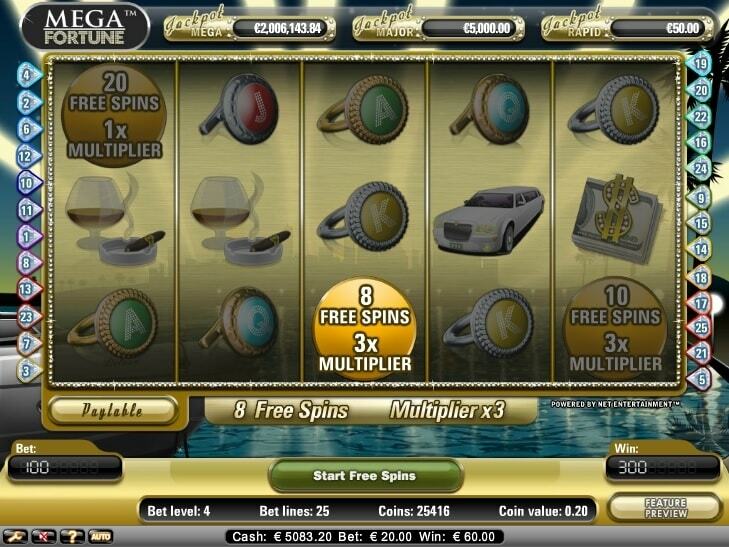 If players land at least three Champagne symbols anywhere on the reels, the free spins round gets activated. Players can re-activate this feature while playing a free spin. Mega Fortune is one of the most popular slots at NetEnt casinos chiefly because of its progressive jackpots. The game is available for fun or real money.